There’s a fabric for each season! For your summer wedding, avoid heavy, weighty fabrics such as a structured satin which tends to look formal. It’s important to pick fabrics that will keep the temperature cool on those sweltering days. If the wedding is outdoors, heavy fabrics are going to absorb heat and bring it close to the body. Chiffon and tulle are fabrics that tend to be less heavy and while a structured dress is figure-flattering, a sheath can do you all sorts of favors, especially if the affair is outdoors. Don’t shy away from bright, funky colors either, hot pink and teal are on trend this year! Depending on the location, don’t be afraid of floral accents or lace as they can create an ethereal look that will only make your outdoor wedding look more beautiful. Pictured below is Margaux by Jenny Yoo, a designer who creates staple summer wedding gowns with crinkle chiffons and silks. For your fall wedding, don’t shy away from darker colors or accents. Brown, taupe, yellow or even orange silk ribbons can belt any structured gown, giving it a pop of color to match the season. While satin might be a little warmer for the mildly chilly weather, try out taffeta or ruched organza. These fabrics, while heavy, don’t weigh more than satin and are less formal. This taffetaLa Sposa gown in ivory is perfect for an outdoor or indoor affair in the fall. It isn’t likely your winter wedding is outside, but if it is, then we commend you for your bravery. Chances are you’re looking for something warm and formal for your dreamy winter wedding. Heavy satins and tulles are perfect for the winter season because they are both traditional and romantic. Winter also is a great time to break out those seasonal colors, such as deep greens, reds and even blacks. Accent a structured fit and flare gown with darkly colored ribbon belts like this style by Rivini, and don’t shy away from diamond accents as decadence and winter are synonymous. Winter is also a season that caters to individuals with a penchant for traditionalism; lace, beading, diamonds, pearls are all more than suitable for winter cathedral wedding. Dalia by Pronovias is the perfect example of a detailed gown for the winter wedding with a thick silk satin skirt and a beaded net bateau neckline. Light and airy fabrics are fun for a springtime wedding! 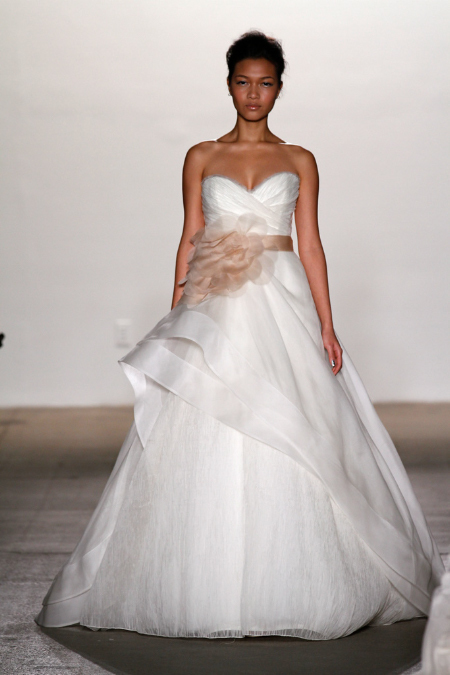 Chiffon, tulle, and organza are not too heavy and can help make a ball gown lighter and more versatile. Besides the fabric, don’t be afraid to play with floral detailing with soft detailed belts, organza petals or lace applique. These details will soften the appearance of any bride and help make the affair romantic and bright. If your wedding is outdoors, have the dress amplify the nature of your venue with blush or pastel pink hues or contrast your surroundings in optical white. The rules for any wedding are always up to the bride. Our rules are just guidelines to suit the season, but personal style and feeling good on your special day are all that really matters!